The Darlington and District Motor Club’s Northern Saloon & Sports Car Championship will see more eagerly anticipated racing with 80 registrations and 26 different models of car takingm part. 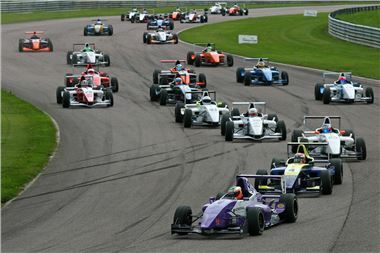 But jointly headlining at the event will be the Formula Renault BARC ‘slicks and wings’ single-seater category – its large grid includes a number of young drivers with aspirations of international stardom and it is these cars that may well produce the fastest lap time of 2012 around the 2.125-mile Croft track. The fastest so far this year is the 1m20.161s lap (95.43mph) set by BARC Clubmans Cup competitor Paul Gibson in April. For the record, the fastest race lap time ever achieved around Croft Circuit is 1m 14.292s (102.97mph), by Japanese driver Takuma Sato during that year’s British Formula 3 event. In addition to Northern Saloon & Sports Cars and Formula Renaults, more exciting categories will be on track at Croft during its 21/22 July event, being organised by the British Automobile Racing Club. Honda V-Tecs, Porsche GT3 Cup, Porsche Club GB, Citroen 2CVs and Mazda MaX 5s – among its racers Brett Smith, son of British Touring Car driver Jeff Smith – will all be in action. Admission for accompanied children aged 15 and under is FREE all weekend. Tickets for adults are just £12 per day and can be purchased via the www.croftcircuit.co.uk website or by calling the Circuit on 01325 721815. It's amazing how much power these cars have. I wonder what it would be like driving one of these down town.